Now You See It... at CHOM! Unless otherwise stated, photo provided by Now You See It... at CHOM! 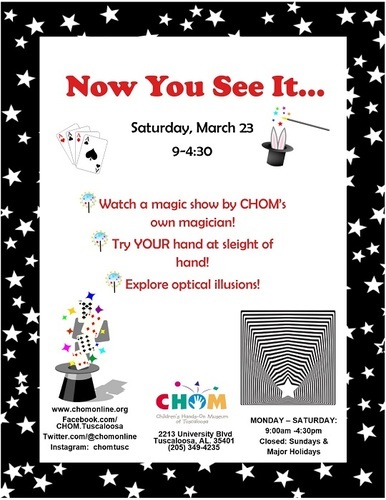 Watch a magic show by CHOM’s own magician! Try your hand at sleight of hand! Explore optical illusions! Didn't use your email address? Use your social media account to sign in. Tuscaloosa is located in the Birmingham & Tuscaloosa Region of Central Alabama. Be sure to check out places to Go, Eat, Stay, and other events in Tuscaloosa.